← Why choose NPC’s Well-being Measure? 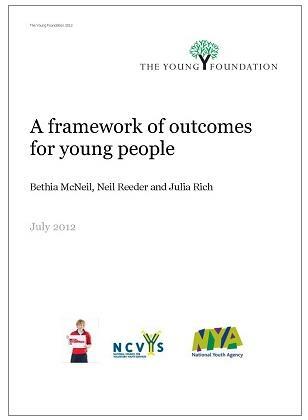 The Young Foundation have today launched their Framework of outcomes for young people on behalf of the Catalyst Consortium working with the Department for Education. Encouraging a stronger focus on building social and emotional capabilities of young people, the Framework helps organisations to articulate the value of youth services at a financially pressured time. As the link between well-being outcomes and long term outcomes, such as employability and good health, is becoming increasingly clear, the role services play is fundamental. Being able to quantify the impact these services have and provide evidence is key. The Framework includes a model of seven clusters of capabilities including confidence, creativity, relationships and resilience and lists tools that can be used to measure each of these. We are delighted that NPC’s Well-being Measure features as an example of a rigorous and reliable tool to capture the value of youth services. We too hope to see a rise in the confidence of practitioners and commissioners in evidencing their impact and working towards a future of improved well-being for young people. For further information on The Young Foundation, Catalyst Consortium partners and to download the full Framework, click here. This entry was posted in General Well-being, Uncategorized. Bookmark the permalink.